PowerGrow Deep Water Culture System. 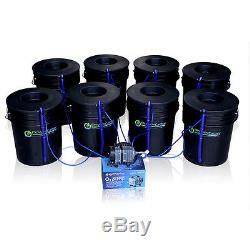 PowerGrow ® Systems 6 / 5 Gallon Deep Water Culture (DWC) Hydroponic System - 8 Sites. Experience how easy it is to grow with a Deep Water Culture System! 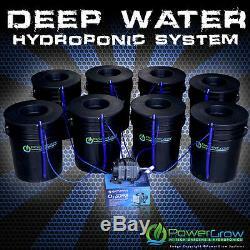 PowerGrow Deep Water Culture Hydroponic System - 8 Site 6 Baskets. Looking for an inexpensive and easy way to grow hydroponically? The PowerGrow ® Systems Deep Water Culture System is the answer! Super easy to use, the DWC system allows you to get up and growing in no time, with very little effort. The PowerGrow Deep Water Culture System includes everything you need for a complete system. In a Deep Water Culture system, the plant roots are immersed in an oxygen infused and nutrient rich water reservoir (a 5 gallon FDA approved bucket). The oxygen rich solution helps build healthy root systems faster and more efficiently than soil which results in superior plant growth and production. The PowerGrow Deep Water Culture System includes the following. (8) 5 Gallon FDA Approved Buckets. (8) 6 Net Pot Bucket Lids. Commercial Grade 951 gph Air Pump with 8 outlet divider Plus FREE 6 outlet air divider! Blue Water Level Indicators + Drains. (Nutrients, growing medium, and pH test Kit not included). So what are you waiting for? Get growing with a PowerGrow® DWC Deep Water Culture System today! FDA Approved 5 Gallon Reservoir Buckets with Water Level Indicators and Drains Not all Deep Water Culture Systems are equal. Many are made from recycled reground plastic and can potentially leach toxins into your reservoirs water. All our PowerGrow DWC systems use FDA approved HDPE reservoirs to ensure that they are safe for food and plant contact. The PowerGrow Deep Water Culture Systems also include a blue visible water level indicator (blue prevents algae growth) that also acts as a bucket drain. 6 Diameter Heavy Duty Net Pot Lid Included is a heavy duty net pot lid that fits over any 5 gallon bucket. The net pot lid allows optimal space for root growth for large plants and holds planting media in place. Industrial 8 Outlet 951 GPH Oxygen Air Pump - Included is an industrial 8 Outlet air pump that pumps up to 951 GPH. Also includes FREE 6 outlet air divider! The Air Pump provides the Deep Water Culture System with the oxygen it needs for a healthy root system. Blue Air Tubing - Also included is (8) 6 foot sections of blue air tubing. Blue tubing is more resistant to discoloration and provides plenty of air flow for your Deep Water Culture system. O2 Oxygen Air Stone Cylinder Stones accelerate oxygen replenishment and increase water circulation in reservoirs, resulting in more oxygen that is readily available to your plants roots. The item "Hydroponic System Deep Water Culture DWC 8 Growing Sites with6 Lids" is in sale since Tuesday, July 31, 2018. This item is in the category "Home & Garden\Yard, Garden & Outdoor Living\Gardening Supplies\Hydroponics & Seed Starting\Other Hydroponics". The seller is "powergrowsystems" and is located in Lindon, Utah.